Achieve more efficient energy consumption and tenant safety with a reliable controls system. Desire to upgrade to the latest technology and give facilities team the ability to control the BAS internally. 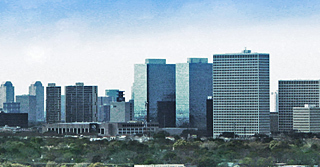 Greenway Plaza is a 52-acre master-planned, mixed-use development with 11 buildings and roughly 4.9 million square feet of office space located in Houston, Texas. Computrols Building Automation Software (CBAS) was installed on the property in the early 2000s as the property management group slowly replacing the existing CSI I/NET system as tenant build outs occured. With only one or two control panels per building, the existing CSI system was simply in place to start and stop the air handling units. In 2005, the property management team decided to be more aggressive with retrofitting one particular building. Computrols technicians installed a 64X controller on every third floor and the building’s performance improved immediately. The success of this initial retrofit and the level of comfort the facilities team developed with CBAS would lead to more significant projects in the years to come. After this initial proof of concept, Computrols was tapped to retrofit the majority of the remaining buildings in Greenway Plaza. In 2006 and 2007, Computrols technicians installed 32X controllers in each of the over 200 mechanical rooms on the campus. As a part of this project, start/stop for air handling units, CT statuses, and a sensor next to each existing pneumatic thermostat were included. Seeing that CBAS was so simple to use, the facilities staff took it upon themselves to replace hot/chill water valves, face/bypass dampers, run wiring, and program the entire system autonomously. As a part of this project, Computrols also installed CBAS Web which gave facility engineers the ability to manage their system remotely. It also gave tenants a simple-to-use platform for scheduling overtime air and lighting. Having maintained a mutually beneficial working relationship for nearly ten years, in 2012, Computrols was chosen to replace the existing access control system at Greenway Plaza. This project involved retrofitting 300+ access points inclusive of elevators, garages, and doors throughout the campus. Computrols technicians also integrated its access control system to the newly installed destination dispatch elevator system in buildings 8 & 12. To ensure security, avoid downtime, and provide a smooth transition for tenants, Computrols also interfaced with the existing access control system throughout the retrofit process. Greenway Plaza’s new access control system was also equipped with an intuitive web-based interface along with customized user interfaces for different user types (i.e. admin, tenant, security, parking, etc.) through CBAS Web. Another feature CBAS provided was the ability to print security badges and put the entire campus in lockdown mode in the event of an emergency. Today, Computrols Building Automation System remains in place at this picturesque campus keeping tenants safe, comfortable, and healthy while giving the inhouse staff the ability to control their buildings.